We weren’t supposed to be in town for Valentine’s Day. We were supposed to be far away from snowy cold Chicago on a Caribbean island. However, Old Man Winter had other plans and ended up blasting the east coast thereby canceling our trip (for now). I had to scramble for Valentine’s Day and whip up something nice without going too crazy. Yes, I know I’ve recommended making apple tarts for a change of pace but having the beachblanket pulled out from under you requires chocolate, so I ended up making some pretty good chocolate truffles: hazelnut, sea salt (one of Cheryl’s favorite combinations), and cocoa coated. If you’ve ever bought chocolate truffles you know they can be on the pricey side. Delicious, but expensive. Making them yourself isn’t just easy, it’s also pretty inexpensive. A one pound block of bittersweet chocolate cost me $9. With that pound of chocolate I was able to easily make 3 dozen chocolate truffles. Make a hard ganache, form small chocolate truffles, and ‘season.’ With the base in the recipe below you can pretty much do whatever you want. Want to add some flavor to the chocolate? Add 1 ½ oz of Grand Marinier or Bailey’s or some other liquor when mixing in the cream. Want to ramp things up and get a little fancier? Re-dip the truffles in more melted chocolate ganache so the nuts, etc. are covered. Make some white chocolate ganache to drizzle over the truffles. Like I said, lots of options, but even the simple ones will impress your guests. 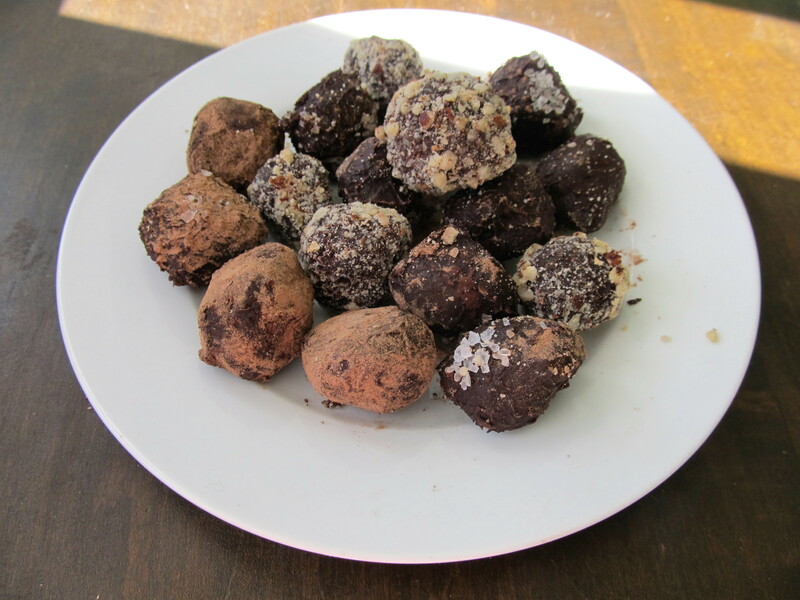 The whole process of forming and making the truffles took about 30-40 minutes. I did have some trouble trying to figure out how to get the chocolate out of the bowl. Most recommendations called for using a melon-baller but I didn’t find the truffles big enough. I ended up taking a knife and cutting cubes out of the chocolate slab then rounded off the corners and rolled the chunks into ball-like shapes. I wasn’t too focused on making perfect spheres since I figured real truffles aren’t, so there’s no reason my chocolate truffles had to be. Shape doesn’t affect the taste. One tip is to make sure you dip the truffles in nuts right after rolling them around in your hands as the sticky outside coating will start to harden back up pretty quickly. Don’t try to roll out a bunch then coat with nuts as the nuts just won’t stick. Place the grated chocolate or nibs into a large bowl. Pour the cream into a saucepan and bring to boil over medium heat, taking care to not let it scorch. Pour the heated cream into the bowl of chocolate and stir, making sure to melt all of the chocolate. Place the bowl in the refrigerator and chill until chocolate is hard. Remove from refrigerator and with a knife, cut the chocolate into small cubes. Press the cubes into a ball, roll around between your hands like making a meatball. The chocolate ball will melt on the outside. When you have the desired shape roll the chocolate truffle in the nuts or cocoa then place on a piece of parchment paper. To finish with sea salt, place the truffle on parchment paper and sprinkle the top with a small pinch of salt. These are beautiful! Hope you still get your vacation some time! Thanks! Going to take another shot at it in a few weeks.